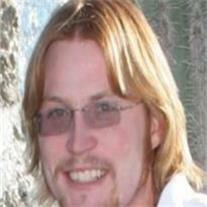 Jeffrey Scot Heinze, 22 years old, son of Jeffrey L. and Peggy Runnels Heinze, died Nov. 6, 2009 in Mesa AZ. He is greatly missed by his parents, his fiancé Rachel Sasser, his sisters Shaylin and Alicia, his grandparents Lynn and Kathy Heinze of No. Ogden, UT, J. Craig and Bonnie Runnels of Mesa, AZ, as well many other family members and friends. Scot loved his dogs, camping, fishing, and his vintage cars. He was a member of The Church of Jesus Christ of Latter-day Saints and was an Eagle Scout. Visitation will be at Bunker’s Garden Chapel, 33 N. Centennial Way in Mesa, Thursday, Nov. 12, 2009 from 6-8 PM. Funeral services will be at the LDS chapel at 3300 N. 1050 E., No. Ogden, UT on Saturday, Nov. 14, 2009 viewing will be held at 9:45 with services beginning at 11:00.